Curlew Cottage01263 715779work01603 870304fax Self-cateringThis beautiful three-storey town house is well-furnished, equipped with modern utilities and tastefully decorated. Featuring pleasant views of the rolling countryside and inviting woodland, there are also sea views on the horizon. The rear garden is a lovely place for guests to relax after a day out walking along the many coastal paths or enjoying the nearby beach. 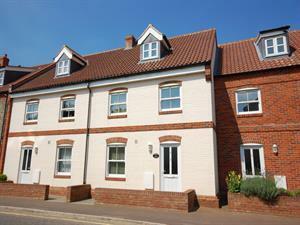 This beautiful three-storey town house is well-furnished, equipped with modern utilities and tastefully decorated. Featuring pleasant views of the rolling countryside and inviting woodland, there are also sea views on the horizon. The rear garden is a lovely place for guests to relax after a day out walking along the many coastal paths or enjoying the nearby beach.